This article is about the U.S. Senator. For the New Orleans lawyer, see Samuel Livermore (legal writer). 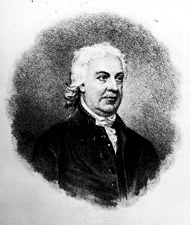 Livermore was born in Waltham, Massachusetts, the son of Hannah (Brown) and Samuel Livermore, and attended Waltham schools. He graduated from the College of New Jersey (now Princeton University) in 1752, then studied law, was admitted to the bar in 1756, and commenced practice in Waltham. He moved to Portsmouth, New Hampshire, in 1758 and later to Londonderry. He was a member of the New Hampshire General Court (the state's general assembly) 1768-1769. He was judge-advocate in the Admiralty court and Attorney General from 1769 to 1774. He moved to Holderness in 1775 and was State attorney for three years. Livermore was a Member of the Continental Congress from 1780 to 1782 and again from 1785 to 1786. He was Chief Justice of the New Hampshire Superior Court of Judicature from 1782 to 1789, and a member of the State constitutional convention in 1788. He was elected to the United States House of Representatives for the First and Second Congresses, serving from March 4, 1789 to March 4, 1793. He was chairman of the House Committee on Elections in the Second Congress. Livermore was president of the State constitutional convention in 1791 and in 1792 was elected as a Federalist to the United States Senate and was reelected in 1798 and served from March 4, 1793, until his resignation effective June 12, 1801, due to ill health. He served as President pro tempore of the Senate during the Fourth and Sixth Congresses. Livermore died in Holderness, New Hampshire and is interred in Trinity Churchyard there. Livermore was the father of Arthur Livermore, a U.S. Representative from New Hampshire, and Edward St. Loe Livermore, a U.S. Representative from Massachusetts. United States Congress. "Samuel Livermore (id: L000364)". Biographical Directory of the United States Congress.